Hello ... Hello ... my old friends ... It's great to see you once again! For just over four years, Yours Truly KJS has been working with Hamilton Radio CEO Gene Pierro to broadcast an internet radio show entitled "Keith James Sinclair Suggests" out of New Jersey, USA. The show features a selection of my favourite tunes by artistes including [of course] ELO & Jeff Lynne, Roy Wood, Roy Orbison and The Beatles plus many of those independent local, national and international artistes who have been featured by ELO Beatles Forever [ELOBF] through the years. 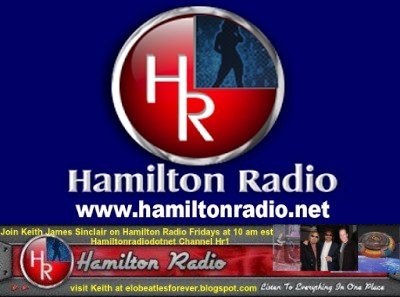 Keith James Sinclair + Hamilton Radio = All the music you'll need!